Managing editor David Donovan comments on the top stories of the past week including news on Turnbull, Morrison, Cardinal Pell and Baby Asha. LAST WEEK, we saw agile, innovative PM Malcolm Turnbull go negative over negative gearing. Labor has been releasing a lot of policy lately and this seems to have spooked the Liberals, with Scott Morrison's speech to the National Press Club this week being nothing more than a collection of platitudes, vague aspirations, banal motherhood statements, and typically bellicose and breathless attacks on the Opposition. Turnbull seems to have heard the treasurer's call, saying Labor's negative gearing policies – which involve removing negative gearing from existing property stock – would see the value of the family home "smashed". Nonsense, of course, but when your family home is worth over $50 million and you have seven other homes dotted around the place, any policy that might affect the value Australia's vastly overpriced housing may be seen as a serious concern. The Government's latest thought bubble, which I fully expect them to run up the mast and then run away from after the public begin throwing rocks at it, as it did with the GST, is to scrap compulsory employer super contributions for low income earners. Why should poor people save for their retirement, you can almost hear the last unlamented treasurer say, when most of them don't live that long anyway? 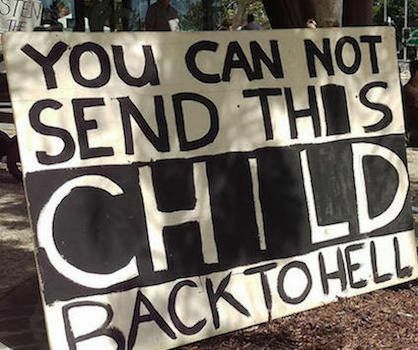 Of course, not everyone has such a poor regard for the underprivileged, as shown by the picket line around the Lady Cilento Hospital in Brisbane, that sought to prevent Immigration from deporting little baby Asha back to Nauru. People power has managed to stop them from sending this poor, burnt little child and her mother back to hell — for now. Of course, as Peter Dutton pointed out, this may still change. Demonstrating his grasp of the situation, Dutton added a clear warning to all those militant babies out there by letting them know that the Government's position was firm, despite the attempted "hijack" of Asha's case by human rights advocates. What part about "baby" does this Government not understand? Speaking of people power. Good hearted people have enabled victims of the Catholic Church to travel to the Vatican to meet reluctant tourist Cardinal George Pell as he gives evidence via hyperlink. Things just seem to get worst for Pell, with a report this week of Victoria Police investigating allegations concerning him personally. I wonder why Big George doesn't want to come to Australia? As big as a bear, he hides in his lair. Whether from heaven or whether from hell, there follows big George a most suspicious smell.